My Favourite TV Programme Essay. Welcome to our website. This is the one of the best and an unlimited the source of Essay and Paragraph. 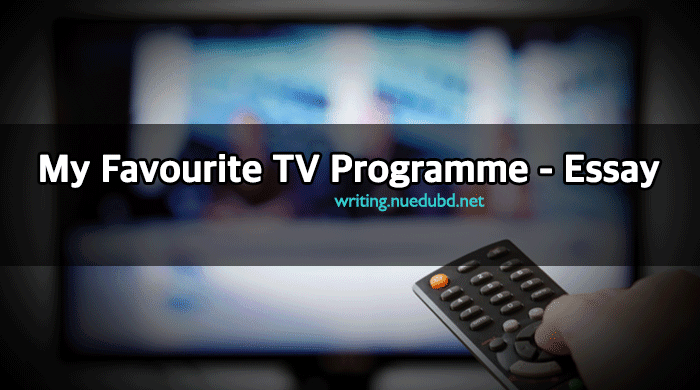 Now NU EDU BD writing section sharing the most useful Short My Favourite TV Programme Essay for you. I hope you'll like it. Education is one of our basic rights. This is very short and easy essay for you. Now check this out the Short composition on My Favourite TV Programme Essay for you. Introduction: TV is a great source of entertainment. A wide range of programmes of varied interest is telecast on TV. Some programmes are entertainment and some are educative. Like other people, I like to enjoy TV. But all programmes are not a favorite tome. The programme: Hanif Sanket is the host of the programme. He is a great cultural figure in this country He is a born artist. His inborn skill has helped him to make the programme popular. The programme is sponsored by Keya Cosmetics Limited. Items: There are many items in this programme. These are songs, fun interviews, quiz programmes for the spectators and so on. World's famous buildings, ancient relics and historical place are also shown in this programme. The viewers learn a lot of things from them. The most interesting item is the fun between a grandmother and a grandson. They make us laugh through their dialogue and activities. We realize that they criticize our society through laughter. The programme inspires me. It shows some disabled people who are working hard. It proves that man's success depends on his strong will. Sometimes the programme gives money to the disabled people. I feel deeply grateful at this. The programme sometimes finds out talented It introduces new singers all over the country. Conclusion: In fine, I must say that 'Ittadi' is my favorite programme. The way Hanif Sanket presents the programme is very interesting. I learned a lot from the programme. I never miss it.